Sunday January 21st 1883 It is horribly cold. It did seem we could not get the work done at all. John & Hatt came over in the afternoon and did not go home till after supper. The new girl came this morning. I read a little in the evening and went to bed early. Monday January 22nd 1883 It was intensely cold this morning but I cleaned the house all up in the forenoon and helped Bridget do some washing in the afternoon. I knit a cotton mitten in the evening. 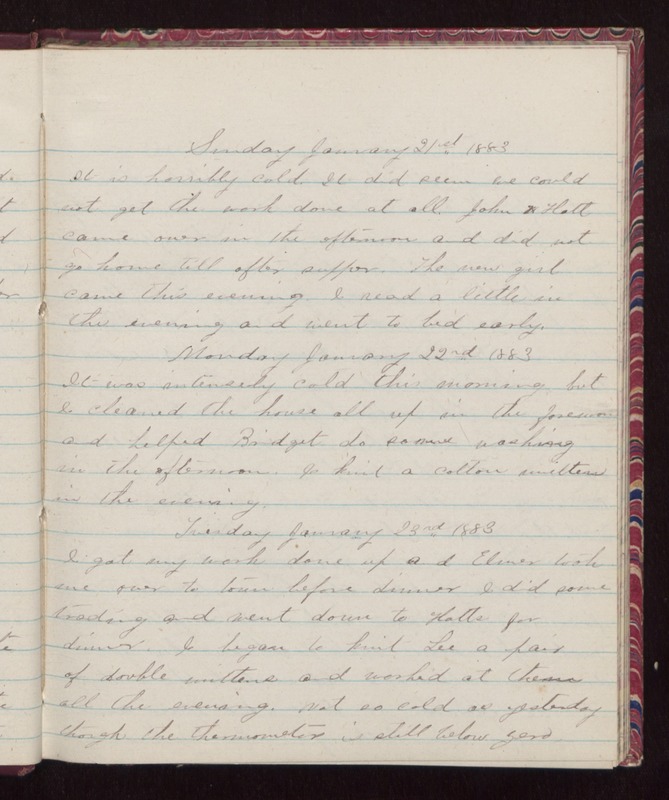 Tuesday January 23rd 1883 I got my work done up and Elmer took me over to town before dinner I did some trading and went down to Hatts for dinner. I began to knit Lee a pair of double mittens and worked at them all the evening. Not as cold as yesterday though the thermometer is still below zero.